This recipe includes eggplant baked with ground venison, seasoned with cinnamon and nutmeg, then topped with a creamy white sauce and baked until golden brown. You can also substitute the sliced eggplant with par-boiled sliced potatoes. Serve this Venison Moussaka with a green salad and a slice of French bread. Heat a 10-12 inch cast iron skillet over medium-high heat and melt 2 tablespoons butter. Add chopped garlic and onions and sauté until softened. Add ground venison and continue to cook until browned. Turn heat to low and add basil, oregano, cinnamon, kosher salt, honey and tomato sauce and cook for 10 minutes. Remove from skillet and set aside in a bowl. Using the same skillet, heat the skillet over medium heat and melt remaining 2 tablespoons butter. Fry eggplant on both sides until golden brown. You will need to do this in batches. Remove and set aside. Heat a saucepan over medium heat. Melt 2 tablespoons of butter stirring in the flour with a fork. When the butter and flour create a paste, slowly pour in the milk and continue to stir until sauce is smooth and begins to thicken. Season with salt and pepper and remove from heat. When the sauce is slightly cooled, mix together 2 eggs and parmesan cheese. 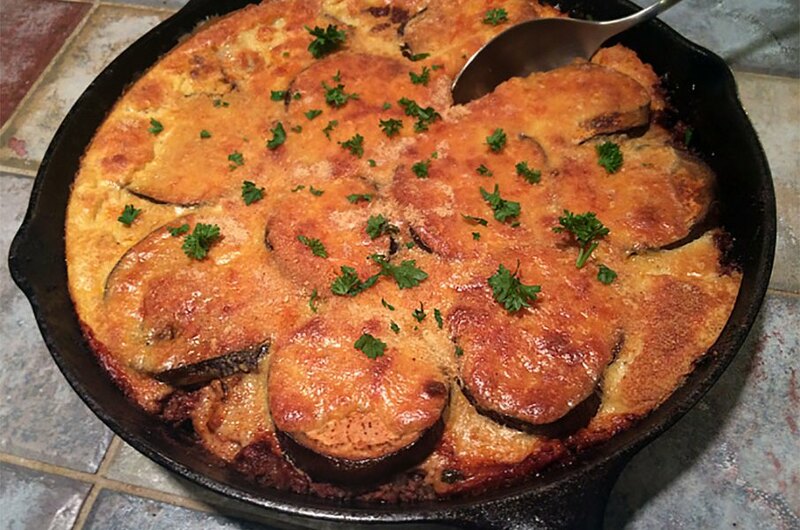 Line the bottom of the cast iron skillet with a layer of eggplant. Spread the venison mixture over the top of the eggplant. Top the venison with the remainder of the eggplant slices. Pour cream sauce over the top and place in the oven. Bake uncovered for 45 minutes. Remove from oven and garnish with chopped parsley.